The short answer to the above question is, both--meaning there really is no wrong answer. Each can be the perfect solution for a particular situation. However, there are a few obvious factors that can automatically determine whether your event will be indoors or outdoors. The type of event, time of year and locale all play a big part. Each type of event brings its own set of advantages and challenges. For example an outdoor wedding would be a beautiful thing to behold, but Mother Nature can have something to say about it; or you’ve finally gotten around to planning for the company party, only to find that all of the indoor venues are booked for the day you must have it. First, we’ll talk about the benefits of having your event indoors. The comfort of your guests is more guaranteed. There will be obvious comforts of the indoors, such as bathrooms, heat, air conditioning, etc. Weather shouldn’t be an issue for you. There is no need to fret and check the forecast twelve times a day because, unless there is a blizzard or hurricane on the way, Mother Nature’s impact will be at a minimum. This way, you can concentrate on other aspects of planning for your event. Because it’s indoors, there may be less equipment you’ll have to worry about renting or setting up. Bathroom facilities, lighting, sound equipment and power are probably already there. Chances are, you won’t have to worry about setting up a dance floor either. Depending on your event, indoor venues have the advantage of separate rooms, if needed. Noise is less of a factor. Whether it’s to afford your guests the privacy of indoors, or not having to worry about disturbing those outside, an indoor event provides a sound barrier for all concerned. Generally, holding her event outdoors can be more cost-effective. For example, having the event in a park or on a beach can be very easy on the wallet, compared to banquet hall. If you know someone who owns a perfect outdoor space, the location could even be free. In addition, you are not as limited in regards to size. When you rent your tent, your rental company can also provide you with everything else you need to get your event off the ground. Power and lighting, outdoor heaters, tables, chairs, linens, portable bathrooms—you name it. Though Mother Nature can be fickle at times, there is no comparison when it comes to scenery and decor. A wedding on the beach? Enough said. 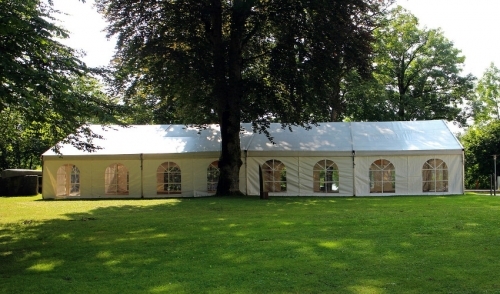 As far as layout and decorating goes, a tented event is essentially a clean slate. Many indoor venues are constricted by architecture, and as a result can limit your choices of table placement, traffic flow, and other elements of your event. Unless there is a particular locale that you simply must have, when you host an outdoor event you don’t have to worry about the venue being all booked up and unavailable. There is much more flexibility when hosting an outdoor event, making the planning process that much easier. If there will be children at the event, an outdoor location is much better suited for them to enjoy themselves. Some children tend to feel cooped up at indoor affairs. Regardless of the type of event you wish to plan, give us a call and let us know what you would like to accomplish. We can discuss with you the risks and rewards of indoor and outdoor events and will be happy to advise on which would best suit your needs.